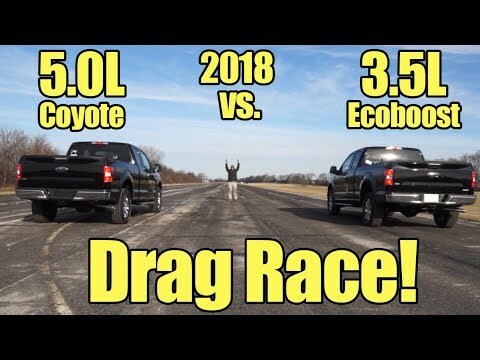 2018 Ford F150 3.5L Ecoboost vs 5.0L V8 Coyote Drag Race! It's Kunes Country Prize Fights! 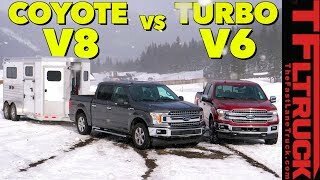 This week it's V8 vs. Ecoboost! 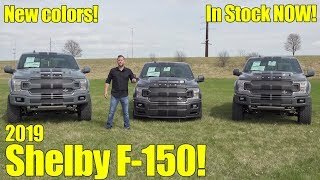 We race the all new 2018 Ford F-150's, both with the new 10-speed automatic! 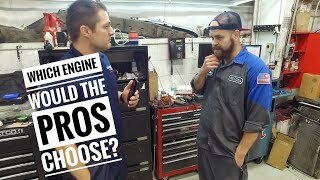 3.5L vs. 5.0L! This one is sure to generate some comments :) Thanks for watching! 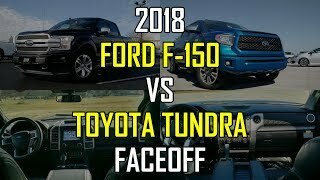 *There's been some questions about driving these before breaking in, both trucks were past the break in mileage before the filming of this video. 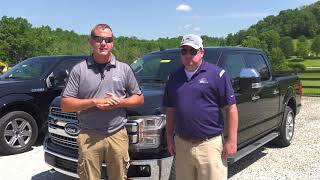 It's not uncommon for dealers to use new vehicles as "demos", and have hundreds, if not a few thousand miles on them but still be sold as "new", and the warranty starts at the time of the sale, regardless of mileage. 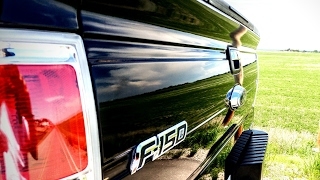 See our entire inventory of lifted, custom, and upfitted Jeeps, trucks, and performance vehicles at www.kunescountrytrucks.com. Kunes Country TV now only if they had a V8 eco boost version. Aw hell just throw on a 76mm TT kit and let the race begin. 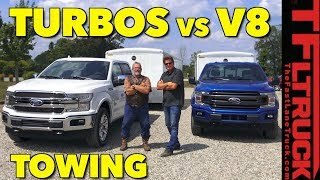 I would take the 5.0 because towing stuff would put less stress on it compared to the V6, and there's still no replacement for displacement. Any one else like me, think that the larger engine would win by a landslide? 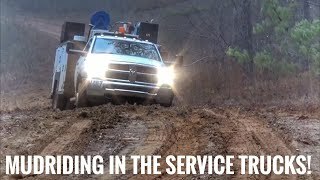 Haha great vid. Both motors are great, one for sound one for performance. Next time leave it in 4wd atuo because the eco boost in 2wd is hard to launch. Put a turbo on the 5.0 and do it again. Doesn’t matter if u own a v6 twin turbo or a v8. We can all agree on one thing. The 1 mpg you save with the ecoboost will pay for the repair cost after 150,000 miles if you're worried about the reliability of the Ecoboost. Put 100,000 miles on both of them and let's see which one is more dependable and not falling apart. 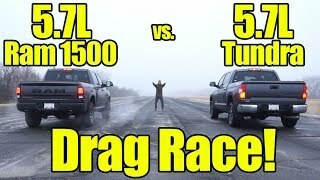 My money's on the V8! 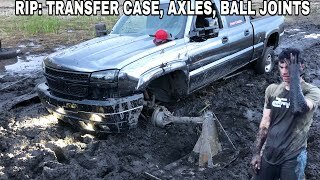 Coyote motor is a beast. Eco-B truly exotic. 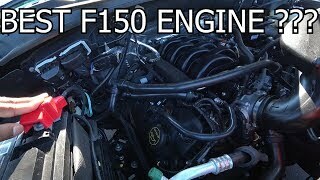 Have a 15 Vert Stang 5.0 automatic. I have no complaints on this car, it is beastly fast without alot of drama and tire smoke. Makes the win look easy when you blast past wth the top down. People hack on the automatics but they are still very fast. Can't wait to drive a newer Coyote with the 10 speed. 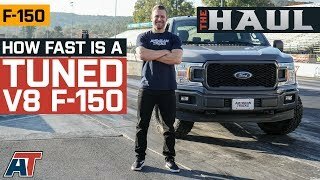 F150 most definitely 5.0 l period!! 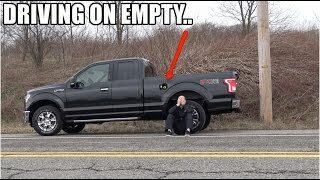 I prefer 5.0 and its all reaction time, great video. Wow, I thought the eco boost was faster. 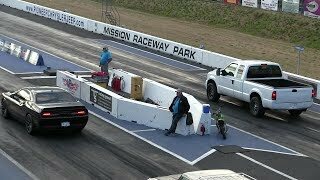 Turns out I'm wrong, 5.0 for the win! Test drove both.Those turbos spool super quick and have more response especially at 3900 ft elevation. 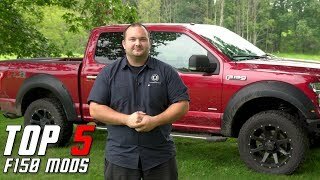 I can tune the 5.0 and of course the 3.5.But if I really wanted power with more reliablity I can whipple the 5.0 and have low boost. 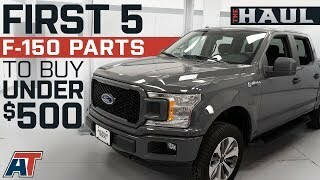 I’ve test drove the older 3.5 ecoboost and was really impressed by it. 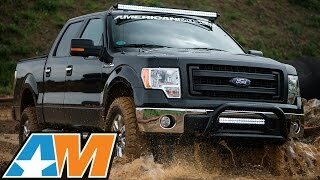 Now the 2nd generation ecoboost with the 10 speed behind it is a whole new animal. 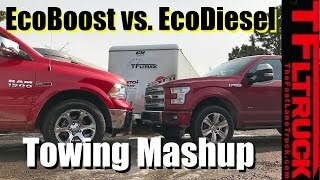 Personally I chose to go with the 2.7 ecoboost because I rarely tow, make a long commute to work, and it was designed to be turbocharged from the get go. 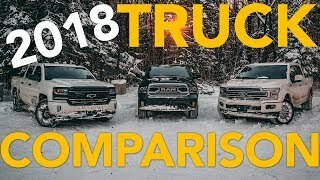 So far I’m impressed with how quick it is compared to my 2014 ram. It feels faster than the ram did even after I tuned the Hemi. Plus it gets way better gas mileage. I was averaging 14 mpg on a 93 octane tune on the Hemi, and 20 combined on the ecoboost. The ecoboost still isn’t even broken in yet and I can tell the gas mileage is going to get even better.